The Thinking the Future London 2019 Conference will be in London on 28th May 2019. Following the successful 2018 inaugural conference a whole day will be allocated in 2019 for the event, which will take place in London in ME Conference Week. The event is free for accepted participants who join this network. It is possible that some contribution to travel costs may be available (this will be determined on an individual basis). An Early Careers Researcher is defined an individual who is within a few years of the award of their PhD or equivalent professional training, or their first academic appointment. This event will be open to postgraduate students and postdocs involved in biomedical research, and also medical students with an interest in biomedical research into ME. 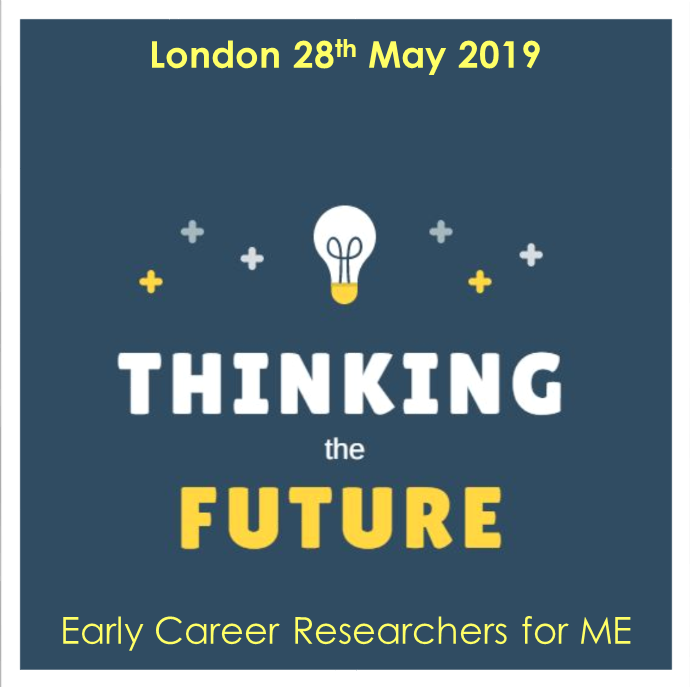 It will provide an international forum where research into ME can be discussed, ideas can be generated and a network built to allow opportunities for those young or early career researchers who are already involved in research into ME, or involved in another research area which may be of relevance to understanding ME. All applications for participation will be considered by the committee responsible for planning the agenda, which will include existing young researchers. For those wishing to present please use the contact form below to contact us and arrange for abstracts/ideas to be sent for consideration for the conference. News of the Thinking the Future event - click on the titles below.